This paper interrogates the early 20th century contours of settler colonial state power in the US. Through an examination of Bureau of Indian Affairs (BIA) archives from 1910-1934 that concern the Tohono O’odham (a federally recognized tribe bifurcated by the US-Mexico border in what is today southern Arizona) and using “incorporation” (legal and cultural) as an analytic, it theorizes the BIA’s multi-layered response to the Tohono O’odham rain ceremony and the “cactus-wine,” Nawait. Pivoting around the late establishment of the Tohono reservation (1916) and the subsequent criminalization, arrest, indictment, and prosecution of Tohono O’odham leaders–who refused to send their children to school and refused to stop their ceremonies– it further argues that cultural and political genocide logically and logistically convened in the early 20th century on Tohono O’odham, compelled by US ideas of sobriety, race, and an ideal US-indigenous citizenship. Finally, this paper lingers on the fractured Tohono O’odham refusals visible in the BIA (colonial) archives. Since the passage of NAFTA peasants have been treated as marginal figures for Mexico’s economic growth and as objects of social re-engineering. One of the most insidious aspects of this social re-engineering is the introduction of ideas about “gender progress”, which are intended to re-educate the rural poor to form the kinds of gender relations that can presumably lead to economic progress and a vigorous citizenry. I draw attention to the contradictions between state formulations of “gender progress” and the racialized and gendered labor niches to which Nahuas and Teeneks of the Huasteca region and Monterrey, Nuevo León are sidelined. Ultimately, I trace how Nahuas and Teeneks position themselves vis-à-vis this form of biopolitical citizenship which emphasizes gender progress as a new metric of inclusion. Fantasia Painter is a 4thyear PhD student in Ethnic Studies at UC Berkeley and a Researcher for the Native/Immigrant/Refugee: Crossings Research Initiative in the Center for Race & Gender (CRG). She is also a National Science Foundation (NSF) Graduate Research Fellow, a Joseph A. Meyers Center for Research on Native American Issues Fellow, and a member of the Salt River Pima-Maricopa Indian Community (SRP-MIC). Hailing from a food desert and actual desert in O’odham territory (Arizona) and by way of Columbia University in New York, “Fan” has an unmitigated love for California produce. She also has a black “Rez-cue” cat and writing-sidekick named Mo. Fantasia’s interdisciplinary dissertation uses ethnographic and archival research to examine the Tohono O’odham, an indigenous community bifurcated by the US-Mexico border in southern Arizona. Specifically, it takes as a starting point the TO Nation’s recent refusal to allow a US-Mexico border wall to be built on reservation land. Coupling Tohono O’odham positionality with the fact that “the wall” serves as a contemporary metonym for racialized US nationalism (a nationalism that has culminated in Trump’s presidency), Fantasia’s research queries the machinations of “race,” “nation,” and “Indigeneity” on O’odham land historically and in the present. Raquel Pacheco received her Ph.D. in Anthropology from the University of California, San Diego in 2017 and is a UC President’s Postdoctoral Fellow in the Department of Anthropology at UC Santa Cruz. Her research interests focus on the intersections between gender, indigeneity, citizenship, and economic restructuring. She conducted ethnographic research on the state’s propagation of so-called progressive gender ideals among rural and migrant indigenous populations in the Huasteca region of Hidalgo and the state of Nuevo León, Mexico. 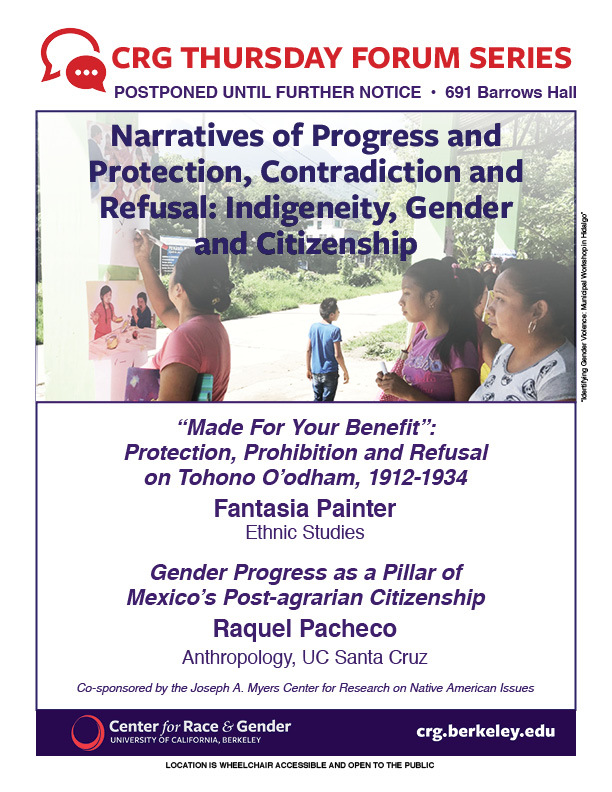 Pacheco is currently working on her book, Re-making the Peasant Countryside: the civilizing project of gender progress in neoliberal Mexico.